"So, my story starts in England in 1998 when I was assigned to work a program for my company. My family came with me and we lived in southern England for 3 years. . . In our small village of Stubbington, my wife's regular hairdresser, Kim, loved to talk about her family and particularly her father, who loved Americans based on his interaction with them during World War II. Her father was a teenage boy who lived in Lincolnshire, a county north of London. The boy lived in a village close to one of the airfields used by the USAAF 8th Air Force, and spent a lot of his time 'hanging out' with the GIs. Kim was kind enough to share her family stories and one of them caught my attention. . . The story goes like this (from a letter written by Kim to my wife Laura) '. . . In 1944 on a Lincolnshire airfield a squadron of American bomber pilots arrived. They had their baseball, and the English pilots had their cricket. One day, the Americans decided it would be fun to make the cricket bat disappear. 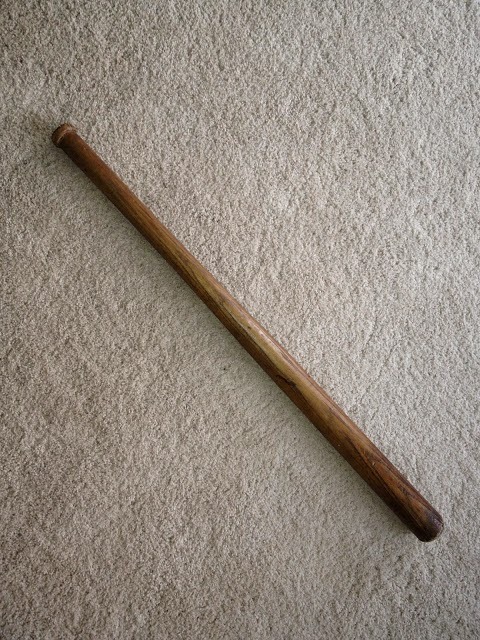 The English retaliated likewise, and the Americans' baseball bat disappeared as well. The local village wainwright's assistant, who was only a young lad, thought the Americans were wonderful. So he made them a baseball bat. 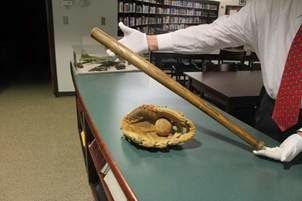 When the Americans finally went home, they gave the bat back to the young lad who made it.' The young lad was her father. Her father always cherished the bat and the memories that it brought back to him of a time when life was uncertain...and a bunch of American pilots entered his world. He always had an affection for America after the war and his trophy bat reminded him of an exciting earlier time in his life." In the coming weeks, we are working to identify the English airfield and the American USAAF unit assigned there as we give this unique artifact a permanent home as part of the Eighth Air Force's honored history.